Not to be confused with the daily newspaper Le Monde. Le Monde diplomatique (nicknamed Le Diplo by its French readers) is a monthly newspaper offering analysis and opinion on politics, culture, and current affairs. 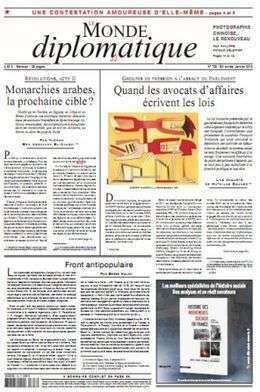 Le Monde diplomatique is a left-wing anti-capitalist newspaper. As of March 2008, the paper was headed by Serge Halimi. It was edited by Alain Gresh. Le Monde diplomatique was founded in 1954 by Hubert Beuve-Méry, founder and director of Le Monde, the French newspaper of record. Subtitled the "organ of diplomatic circles and of large international organisations," 5,000 copies were distributed, comprising eight pages, dedicated to foreign policy and geopolitics. Its first editor in chief, François Honti, made the newspaper into a scholarly reference journal. Honti attentively followed the birth of the Non-Aligned Movement, created out of the 1955 Bandung Conference, and the issues of the "Third World". Claude Julien became the newspaper's second editor in January 1973. At that time, the circulation of Le Monde diplomatique had jumped from 5,000 to 50,000 copies, and would reach, with Micheline Paulet, 120,000 in under 20 years. Without renouncing its "Third-worldism" position, it extended the treatment of its subjects, concentrating on international economic and monetary problems, strategic relations, the Middle-East conflict, etc. Le Monde diplomatique took an independent stance, criticizing the neoliberal ideology and policies of the 1980s, represented by Margaret Thatcher and Ronald Reagan. After the November 1989 Fall of the Berlin Wall and the 1990-1991 Gulf War, the newspaper made a turn and criticized what was described as an "American crusade". Ignacio Ramonet was elected director in January 1991. Le Monde diplomatique analyzed the post-Cold War world, paying specific attention to "ethnic" conflicts – the wars in former Yugoslavia, the 1994 Rwandan Genocide, the conflicts in the Caucasus, etc. – as well as to the new information technology. After having published a famous editorial in January 1995 where Ramonet coined the term "pensée unique" ("single thought") to describe the supremacy of the neoliberal ideology, the newspaper supported the November–December 1995 general strike in France against Prime minister Alain Juppé's (RPR) plan to cut pensions. Three years later, after a proposal in a 1997 editorial by Ignacio Ramonet, Le Monde diplomatique took a founding role in the creation of ATTAC, an alter-globalization NGO, which was originally founded for advocacy of the Tobin tax, and which has since spread throughout the world. It now supports a variety of left-wing causes. The newspaper also took an important role in the organisation of the 2001 Porto Alegre World Social Forum. After the Second Gulf War starting in 2003 under the George W. Bush administration, Le Monde diplomatique continued its position of criticizing the US policy of "violent intervention" in the Middle East and the neoconservative' project to "reshape" the so-called "Greater Middle East" region. Hugo Chávez and his Bolivarian Revolution also became popular with Ramonet and he supposedly had a close relationship with Chávez. André Fontaine, the director of Le Monde, signed a 1989 convention with Claude Julien which guaranteed the monthly's autonomy. But it gained complete statutory, economic and financial independence in 1996 with the creation of Le Monde diplomatique SA. With a donation from Günter Holzmann, a German antifascist exiled before World War II to Bolivia, the monthly's employees acquired approximately one-quarter of the capital, while Les Amis du Monde diplomatique, a 1901 Law association of readers, bought another quarter. Thus, since the end of 2000, the newspaper's employees and readers retain 49% of Le Monde diplomatique SA's capital, largely above the control stock  necessary to control the direction and editorial line of the Monde diplo. The remaining 51% is owned by Le Monde. Jean-Marie Colombani, former editor of the daily Le Monde, was attributed by Le Monde diplomatique's former director general Bernard Cassen as saying: "Le Monde diplomatique is a journal of opinion; Le Monde is a journal of opinions." The Norwegian version of the July 2006 Le Monde diplomatique sparked interest when the editors ran, on their own initiative, a three page main story on the September 11, 2001 attacks and summarized the various types of 9/11 conspiracy theories (which were not specifically endorsed by the newspaper, only reviewed). The Voltaire Network, which has somehow changed position since the 11 September attacks and whose director, Thierry Meyssan, became a leading proponent of 9/11 conspiracy theory, explained that although the Norwegian version of Le Monde diplomatique had allowed it to translate and publish this article on its website, the mother-house, in France, categorically refused it this right, thus displaying an open debate between various national editions. In December 2006, the French version published an article by Alexander Cockburn, co-editor of CounterPunch, which strongly criticized the endorsement of conspiracy theories by the US left-wing, alleging that it was a sign of "theoretical emptiness." The Norwegian Le Monde diplomatique, did again however mark its difference from the mother edition by allowing David Ray Griffin's response to Cockburn to be published in their March 2007 issue. Although Le Monde diplomatique publishes few advertisements in order to retain its editorial independence, it has sometimes been criticized for the quantity and nature of the published advertisements . In November and December 2003, two-page advertisements by IBM and a car manufacturer were placed. The issues of February and March 2004 contained advertisements by Microsoft in a "social" atmosphere with a picture of children, which led to agitation. 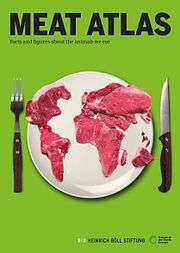 Le Monde diplomatique co-publishes the Meat Atlas, which is an annual report on meat production and consumption. ↑ Martell, Luke (2010). The sociology of globalization (Repr. ed.). Cambridge: Polity. p. 243. ISBN 9780745636740. 1 2 3 Harvey, Nicolas. "Alternative Mass Media and Worldwide Mobilization: The Difficult Crusade of Le Monde Diplomatique against Neoliberalism". International Political Science Association. Université Rennes. Retrieved 8 February 2015. ↑ Henry Samuel (24 April 2009). "US authorites [sic] divert Air France flight carrying 'no-fly' journalist to Mexico". The Daily Telegraph. London. ↑ "French Newspapers - The Press in France". French property. ↑ Gonzalez, Angel (August 2003). "Chavez's Remarkable Staying Power Chavez in Person: The President As a Master of Improvisation". PBS. Retrieved 19 February 2015. ↑ Clark, A.C. (2009). The revolutionary has no clothes Hugo Chávez's Bolivarian farce. New York: Encounter Books. p. 126. ISBN 1594034451. ↑ Cassen, Bernard (interviewee) (January–February 2003). "On the attack". New Left Review. New Left Review. II (19). Wikimedia Commons has media related to Le Monde diplomatique.